One of the new characters is The Boss. He wins whenever the Green or the Blue Team wins, but always gets one Gold Piece less than them. Then there is The Profiteer, who, true to his name, doesn't just win when the gold-diggers (Green or Blue) win, but also when The Saboteurs win. However, he has to be content with two Gold Pieces less. The Geologist doesn't care much for treasure hunting. He is after the valuable crystals in the tunnels. For each visible crystal, he receives 1 Gold Piece. Play the expansion over three rounds (like the base game), and in the end, the player with the most Gold Pieces wins. Use the rules from the base game with the changes indicated below. All cards from this expansion have a "2" in the lower left corner for easy sortin. First, take the Dwarf Cards and the Gold Piece Cards from the base game deck and put them aside. You won't need them for this game. Next, find the Start Card and the three Goal Cards and lay them out as described in the base game. Shuffle all Path and Action Cards from the base game and this expansion together and put them to the side in a face-down pile. Before each round, take the 10 top cards off this pile and remove them from the game without looking at them. Then deal each player 6 cards, no matter how many of you are playing. Then shuffle all 15 new Dwarf Cards and deal one face-down to each player. Again, it does not matter how many players are taking part in the game. Each player looks at his or her Dwarf Card and puts it back down, taking care not to reveal to the other players which role he or she is going to play in this round. The remaining Dwarf Cards are not dealt, but put aside face down. 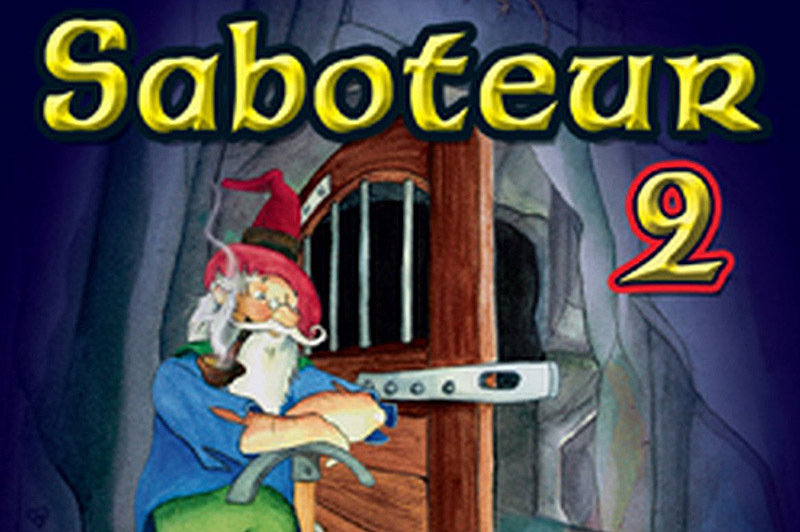 The players' Dwarf Cards are only revealed at the end of each round. The youngest player goes first, then the other players follow in a clockwise direction. Both teams try to tunnel their way towards the treasure, but they are in competition. 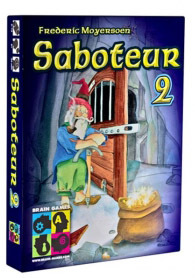 Both teams win (along with all other "non-Saboteurs") if The Boss, The Geologist or The Profiteer creates the connection to the gold and the way there isn't blocked by a door of the other color. The Boss builds tunnels for both the Green and the Blue Team and wins every time one of the teams wins. When the treasure is split, The Boss always gets one Gold Piece less than the other winners. The Profiteer profiteer wins, no matter if The Gold-Diggers or The Saboteurs are successful. However, when the treasure is divided, The Profiteer gets two fewer Gold Pieces than the others. The Geologist dig at their own expense, so to speak. They aren't particularly interested in gold. When the treasure is split, a Geologist gets as many Gold Pieces as there are crystals visible in the maze of tunnels. If both Geologistsare in play, they split the Gold Pieces (rounded down). Place a path card in the tunnel maze.......................................................then draw 1 card. Play an action card....................................................................................then draw 1 card. Discard two cards from your hand to remove a card in front of you.....then draw 1 card. Pass and discard 1-3 face-down cards from your hand.........................then draw 1-3 cards. Then your turn is over and it's the next player's turn. Note: When the pile is used up, no cards are drawn, but players still have to play at least one card. If a player runs out of cards, that player has to pass on all remaining turns in this round. (This can happen towards the end of the game). This card shows two straight paths that are not connected. You can-not turn left or right on this card. When you play this card, at least one of the two paths has to be connected to the Start Card. Again, this card shows two paths which aren't interconnected, and, when played, at least one has to be connected to the Start Card. The path on this card is always connected to the Start Card and to all other cards with a ladder. It always has to touch a path card and cannot be placed next to a goal card. A path with a green or blue door can only be used by the team of the same color. On some other path cards you may see Crystals. They have no effect on the path's connections. As in the base game, in this expansion no player can have 2 action cards of the same type affecting them at the same time. You play this card face-up in front of yourself. At the end of the round, after the Gold Pieces have been distributed, you can steal 1 Gold Piece from any one player (if they have one). Then discard this card. You cannot use this card if you are trapped. If you play this card, you can remove one Theft card from in front of any player. Discard both cards. The player who plays this card chooses one other player and exchanges hands with them. Discard the action card, then the other player gets to draw 1 card! If you play this, you may look at the dwarf card of any one other player. Then discard this card. Choose one player (including yourself) who has to discard their current Dwarf Card (without showing it to anyone), then the player in question draws a new Dwarf Card from those leftover at the beginning of the game. Discard the action card. Play this card face-up in front of another player of your choice. This player is trapped and cannot play any more path cards. If a player is trapped when the round ends, they don't get counted as one of the winners and don't get a cut of the treasure. If you play this card, remove one Trapped! card from in front of any player. Discard both cards. By discarding any 2 cards from their hand, a player can remove any one of the cards in front of him or her and discard it. Please note that the player then only draws one new card. If you do this, you reduce the size of your hand by one each time. If a player can't play a card or doesn't want to, he or she has to pass and discard 1-3 cards from his or her hand face-down. He or she then draws the same number of cards. The round is over when a path is completed from the Start Card to the Goal Card with the Gold Nugget OR no player can play any more cards. 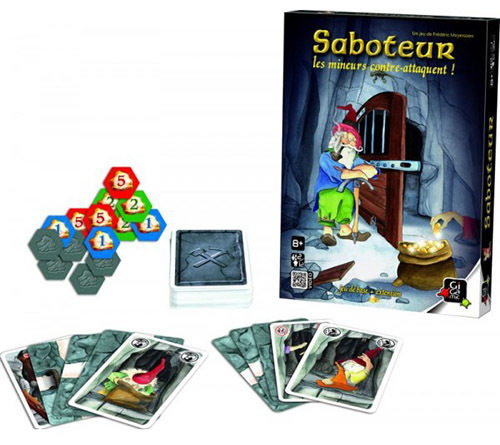 Depending on whether there is an uninterrupted path from the start to the treasure or not, the Gold-Diggers or the Saboteurs win the round. If the path to the treasure is blocked by a door, only the dwarves from the team of the same color win. Now, work out the total number of points worth of Gold Pieces (GP) each of the winners receives. Players who have a Theft Card in front of them can steal one GP from another player. Players can make change as necessary. The last player to play a Theft Card can steal first, then other players with Theft Cards go in clockwise order. Players cannot conceal whether or not they have GP but they can keep the total a secret. Put the Start and Goal cards back on the table. Shuffle all action and path cards, including the 10 cards you have put aside before the start of the last round, and put them to the side in a new face-down pile. Again, take the top 10 cards off the pile and put them aside. Deal 6 cards from the pile to each player. Re-shuffle all 15 Dwarf cards and deal one to each player. The player who sits to the left of the player having played the last card of the last round starts off the new round. The game ends after the third round. Each player totals up the Gold Pieces he or she has collected and the highest total wins. If two or more players are tied, they all win.